Life is busy with a one year old and a new job. Downtime for DIY projects is rare these days. Poor baby #2 is getting hand-me-down DIY projects that Judah has outgrown. One thing that I knew I wanted to make was a baby mobile. Judah was gifted one at his baby shower, and he absolutely LOVES it. I put together my list in October so I could stock up on fabrics when they went on sale. Then the fabrics sat in a pile until I could get started on my projects over Christmas break. I'm very happy with the progress I made! Take a look at the finished projects and be sure to head over to the blog tutorials that are linked--as a beginning level seamstress, these tutorials were great for my skill level and will be for you too! Of course you knew I'd be making one of these for our little one, didn't you? I've made several for friends, and loved mine when I was a kid. I've just been biding my time until I can make one for my own kiddos. Take a look at my baby's first quiet book! One of the things my husband and I have in common is our love for books. 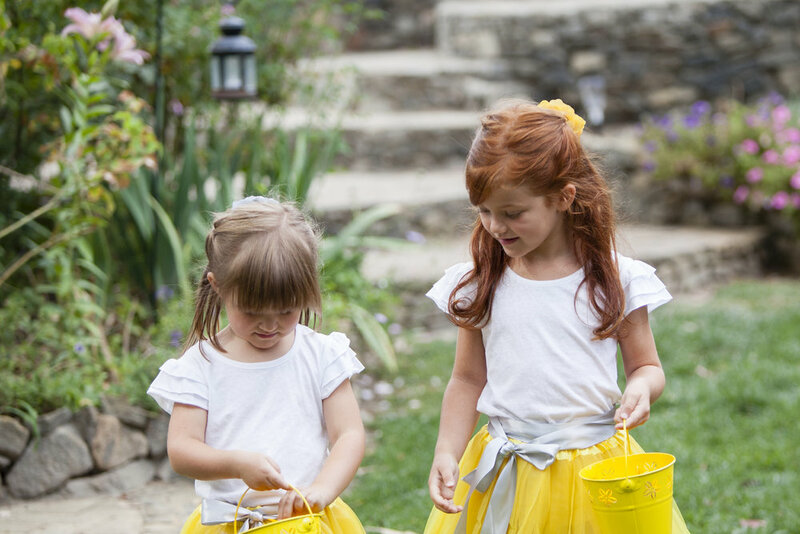 This love came into play in our wedding in many ways that I was THRILLED to death about, but one of the ways this fancy has lent itself is an amazing DIY project we undertook for the littler helpers in our wedding party. When I was a young girl, a good, family friend who is an amazing seamstress (she actually altered my wedding dress for me!) made my siblings and I a quiet book. My parents also made us a couple. I adored those books! It was perfect for taking to "big" church with me so I could stay quiet and occupied while still taking part in the church community. I loved that book so much, I made one for my little sister to match mine since she didn't have one. Granted, my cutting skills weren't what they are today, so the edges were all a little crooked. But it was a first attempt that has only magnified my desire to make another one. I've been pinning ideas for quiet book pages on my Pinterest so I could remember them for when I had kids and had someone to make it for. Lucky for me, our wedding gave me an early excuse to make a few of those awesome pages. May I also take an aside and exclaim over how much quiet books have developed since I was little?!? Holy moly, some of these ideas are incredible! I was so excited to make one!! In this particular post, you will get a picture of my finished page, a link to where I found the pattern or where I was inspired, and some instructions/tips to make a quiet book like mine! Binding was done with embroidery thread and a needle. It was too thick to use my sewing machine. I didn't make my binding fancy. I just cared about it being a fun color and being secure. I made it by stacking the pages how I wanted them, wrapping a rectangular piece of felt over the top and bottom page, and sewing through all the layers. Nothing fancy! I used some fun embroidery thread that changes colors as you get to different parts of the thread. I had lofty plans to cut out letters from felt and blanket stitch the edges, but this project needed to be finished and other projects needed to be started. (Welcome to wedding planning!) So I opted for some fun, colorful puff paint--remembering how much I liked the feeling of dried puff paint when I was a kid. It was so fun to let our little helpers open them up before the wedding. The looks on their faces were so precious. They didn't want to stop looking at them! It was the best gift ever in my opinion, and very deserving for these three kiddos who traveled by plane from afar just to be in our wedding and wow our guests with their cuteness. Though I am in the midst of wedding planning, there aren't too many crafts I can do myself that don't require my fiancé's expertise, so the crafting bug itching inside of me this weekend set out to do a just-for-fun craft. For any of you that are teachers or that know a teacher who would like one, this is a simple and adorable craft project for you to try out. I first saw this on Pinterest--pinned from a craft suggestion from my all-time favorite Hobby Lobby, and fell in love with it. I knew I needed it for my classroom. I thought it would be a good replacement for next year when my crayon art currently in my room is no longer applicable. We (sadly) don't have a Hobby Lobby near us, so I found all my supplies from Michaels during my break between Parent Teacher Conferences (and was therefore a couple minutes late to a conference, whoops!). Arrange the crayons around the wreath to figure out where you want to glue them. Since it's a circle, the ends of the crayons should be touching, but the tips should have a little space between them. I positioned the crayons closer to the end on the wreath frame. You'll want to leave a little space that's the width of the thicker ribbon to hang it. Tie a piece of thick ribbon around the space in the frame and glue it in place. Glue all the crayons in place. I did about three at a time. Write your last name on the chalkboard, or print it out and cut it to fit the picture frame. Glue your wooden letters to the top; you can paint them first if you'd like. Position the frame on top of the crayons and lay out the clothespins along the ends of the crayons, leaving a space where the frame is. I made two rows of clothespins, each row face a different way. Glue the frame in place. Tie into a bow, and glue in place to cover the frame where the hanging ribbon was tied. Let it dry, tie the top ribbon into a bow that makes it hang at the desired length and you're done! A $20 [I desperately need a me-craft day] project in two hours makes this teacher extremely happy! I've had my desk chair for about 6 years now. The girly, flower power fabric is faded and dirty looking. It's a reminder of times past and as I begin looking to a future home of my own with my future husband, I decided it was time for a revamp on this seen-better-days fabric. I have held onto the scraps of the to-die-for, thick, yellow and white fabric my brother and sister-in-law used for the table runners at their wedding. I knew I'd find the perfect use for it someday, and that day has arrived! It barely fit the width of the chair but I made it work. It was super easy, like I assumed it would be from pictures floating around Pinterest. I did mine the extra easy way and didn't even detach any of the parts. Remove the staples. There's a lot of them. Please wear gloves to avoid scraped knuckles and scratched fingers. Cut the fabric to a couple inches wider than the chair seat and back, wrap it over top of the existing fabric (extra padding! ), and staple gun it in place. It's my last week of summer vacation, and while last week I was thrilled to death to start the new school year, the arrival of my last week of freedom suddenly changed that emotion. Now I am dreading it because it's crunch time and I actually have to get stuff done instead of doing it a little at a time at my own pace. All that to say, I didn't have an extra shelf to keep their binders on, nor did I really want them out of their seats, crowded around the same shelf to get their binders every morning. That's where the chair pockets come in! I saw them floating around on Pinterest and said, "I could totally make that, easy peasy." So I busted out my box full of fabric leftovers and made a gallant attempt. I needed 15 of them, but I didn't want to make all of them before getting to school and making sure it actually fit on the chair. To my relief, it did, though it only held a single 1-inch binder comfortably. (I had been hoping they could store their Bibles in there too, but we'll just have to keep those in their cubbies--not really a problem since they only need them on Wednesdays.) Here's the tutorial for you to try it yourself. It's SUPER easy. I can sew, but don't really follow patterns. I'm one of those, let's look at it and figure it out ourselves types when it comes to sewing. (Don't hate.) But I promise you, you can make this too--no matter what your sewing level is. This tutorial is for a small, school chair. The dimensions of my chairs were 11" from seat to top, 12-1/2" across base of chair back, and 9" across top of chair back. 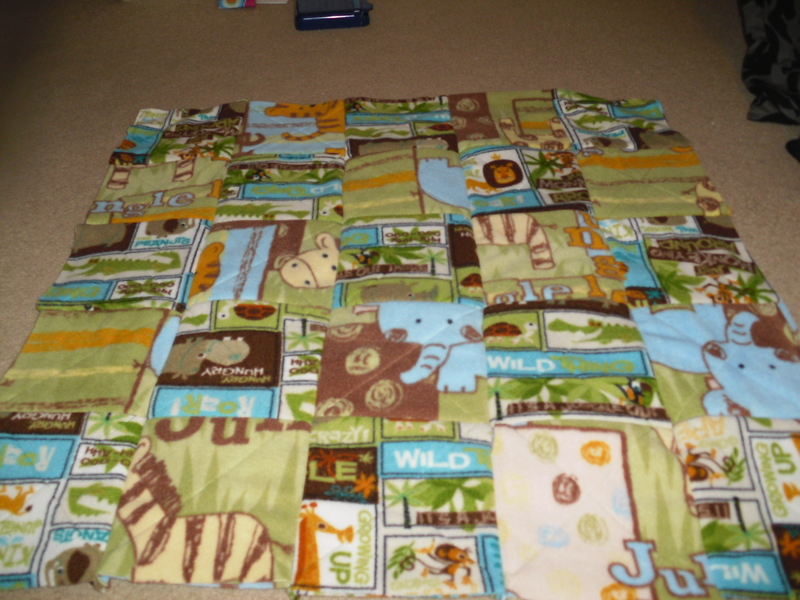 **I used a thinner, cotton fabric that was the same on both sides. Since it was thinner, I planned to fold it in half to thicken it. If you are using a thicker, more durable fabric like denim, you can halve the measurements. You should make sure the fabric print is the same on both sides if you are not halving it. Directions: Cut fabric to 27-1/2" x 29-1/2." Fold it in half; the 27-1/2" side should form the top and bottom or the short sides of the rectangle. Sew the three, loose edges together, leaving a hole in one corner to turn it inside out. Turn it inside out, sew the hole closed, and iron it flat. Fold the now rectangle fabric in thirds. One third should fold behind and one third should fold in front so that the folded edges of the fabric are facing opposite directions. You can see my finger is pinching the folded side of the top pocket and on the opposite side, the folded edge is on the bottom. Now sew the short sides closed with a 1/2" seam. Ta-da! You're already done! Easy huh? 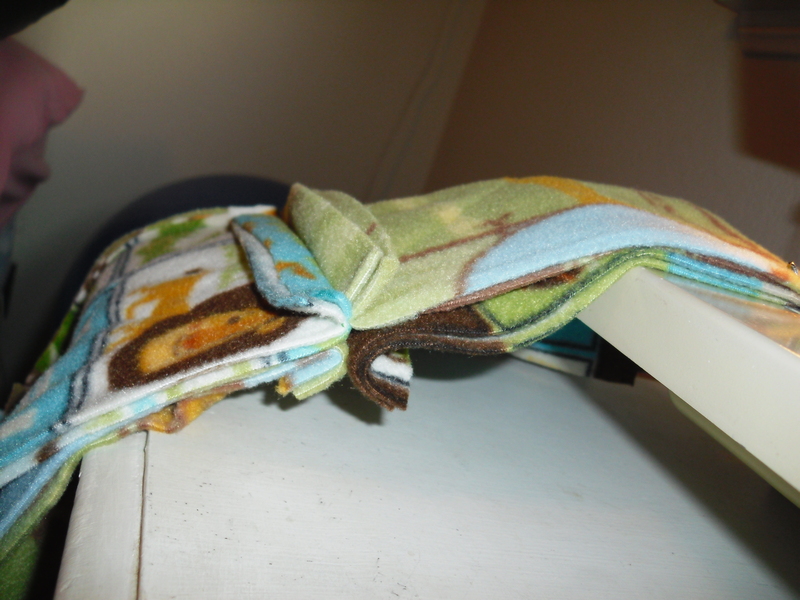 :) One open pocket goes over the chair back, and the other is a pocket for you to stick a binder in. The summer camp I'm working for at my school this year is having a princess, prince, knight, king, queen, whatever you want to call it theme. The end of the summer is going to be a big, fun fair for the kids (themed as well, of course). My boss saw a picture of these photo booth props on Google Images and thought to herself, "Tabitha is so creative, I bet she could make these!" Or something along those lines. ;) Seeing the picture myself, I was totally in. For one, it's Disney. For another, I love photo booths. I was hooked when I saw these, and thought to myself about how much I love when people put up tutorials and FREE stuff on their blogs to help other crafters to make those wonderful projects too. So, after several hours of labor sketching and cutting and piecing things together. I have made you FREE patterns(!) so you can make them too! 1) Download and print the pattern for the princess you want to make. 2) Cut out each piece. 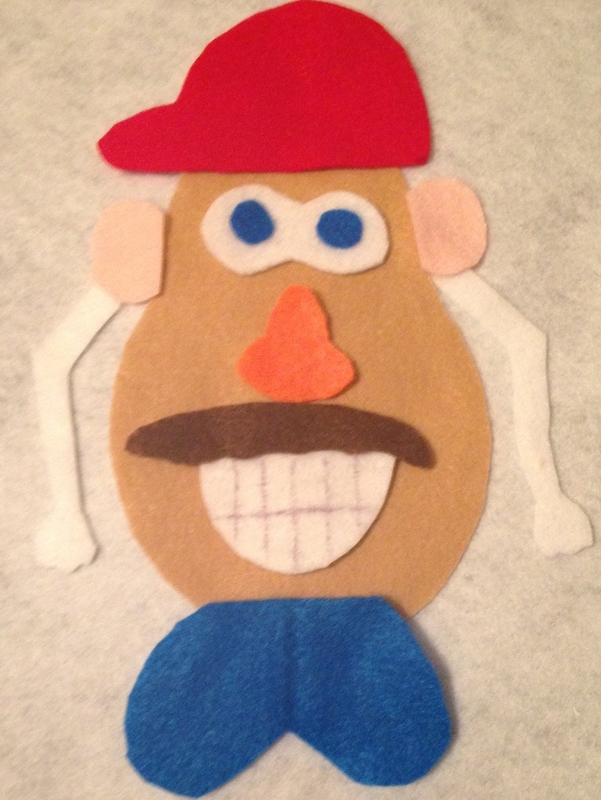 3) Trace around each piece on the specified color of felt. Pencil worked fine for me. 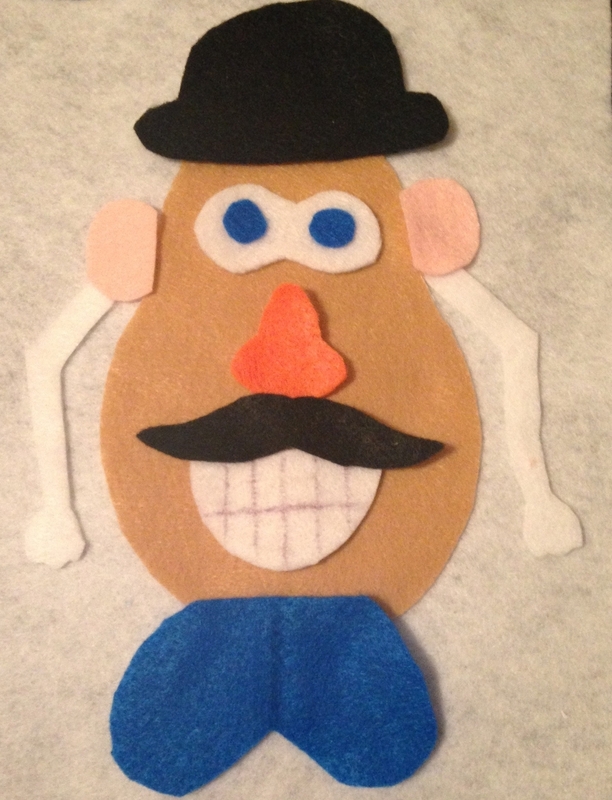 4) Cut out the felt pieces. **Let each part dry before assembling the remainder of the bow. 6) Assemble remaining pieces as directed on pattern pieces with glue. 7) Add dowel with glue. 9) Have fun with the cutest props ever!!! I've seen these floating around on Pinterest for a while and saved it for later. My fiancé has 2 magnets that have worked for a while. But lately he's been getting graduation and baby announcements from cousins that have been getting little too heavy for those two magnets. So while I was house/petsitting for him, I determined to finally make some and get those pictures nice and spread out so you can actually see all those beautiful people. I followed the tutorial on Not Martha, though I tried it first with flatter magnets that come in the tape roll and have a sticky side. I didn't want them sticking out so far with the bigger ones she used. They stuck on great. And then I tried to use them to hold up a picture and they slid all the way down off the fridge. Back to the store I went, purchasing the big ones. I stuck them on with tacky glue and let them sit overnight. You have to make sure they're not sitting close together because the magnets are really strong and they start sliding toward each other while the puddle of glue is drying! Overall, very easy. Get a bag of clear, large, flat bottomed marbles from Michaels. They're by the floral foam. Get a package of thick, circular magnets, from the very back of the store, just behind the wood projects. Cut out some scrapbook paper in the shape of the marble, glue on (tacky glue worked fine) to the flat side of the marble, and let dry. 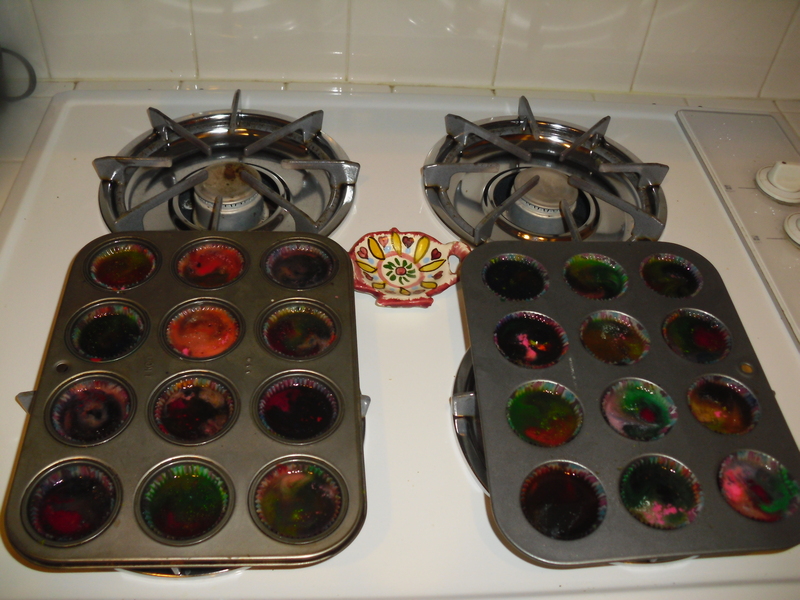 Then glue on the magnets with tacky glue and let sit to dry. I wouldn't use the magnets until the next day, just to make sure they've had enough time to set. A friend of mine is having her first little baby boy in January. I’m so excited! I was bored of buying shower gifts off registries though (thanks to 12 weddings attended this year) so I put it in my mind to make something. I’ve been wanting to make a rag quilt since I hung out at my friend Erin’s house, and she showed me the HUGE rag quilt she made, which she proclaimed to be super duper easy. I thought this was the perfect occasion. Baby size things are a little more doable for your first go of things, in my humble opinion. 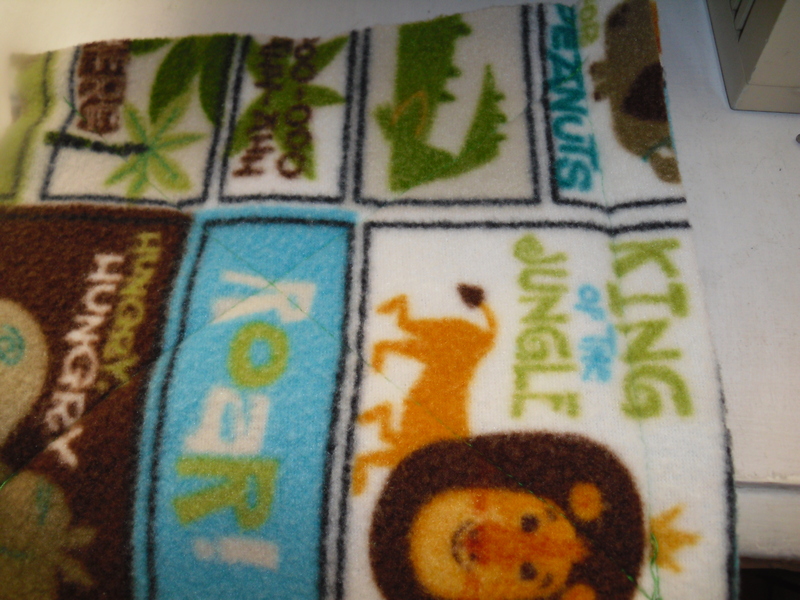 My friends are doing baby stuff in jungle theme, so I hopped online to Joann’s during their 50% fleece sale and found some cute prints. On Tuesday I sat in front of the TV to get my Glee fix while I cut the squares. 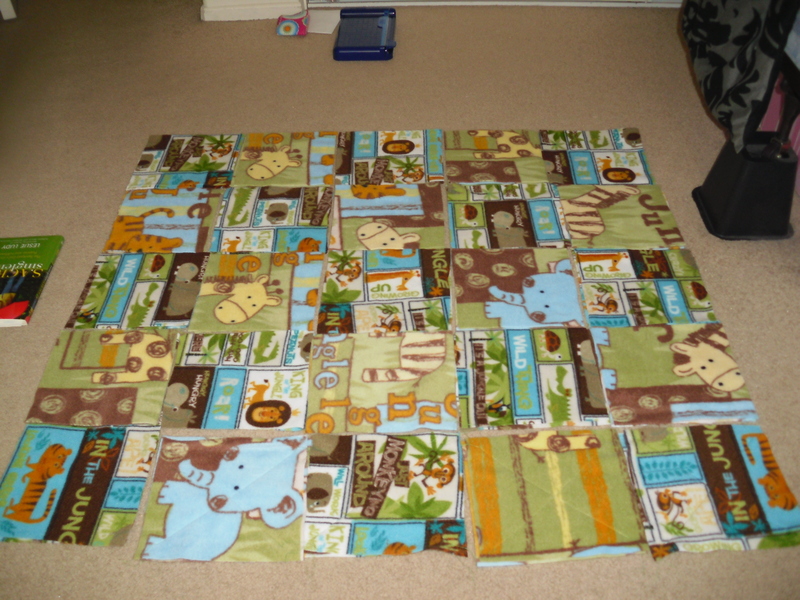 For a 40″x40″ quilt, I got 2 yards of fabric total–one yard of each print I wanted to use. I cut the squares 8″x8″. First, I laid out all the squares in the order I wanted them. This was to make sure I had enough of each kind of fabric, and to ensure that my cutting job wasn’t off. 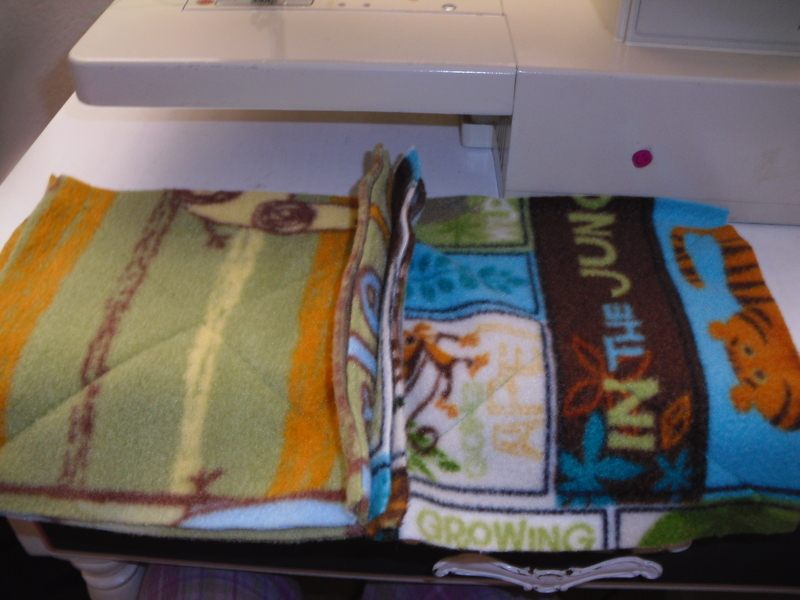 I did two layers of fabric, so I have two squares of fleece stacked. I used the same patterned squares together. 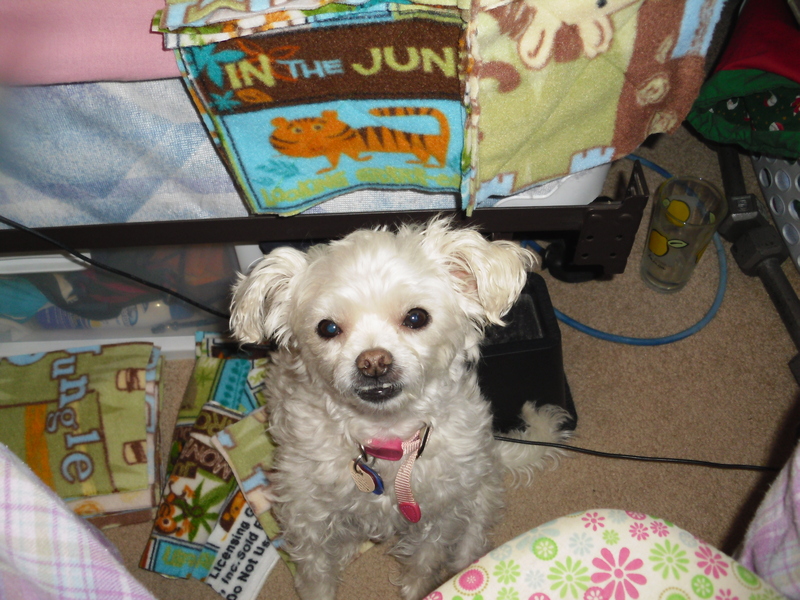 On each square, I sewed two diagonal lines from one corner to the other corner. 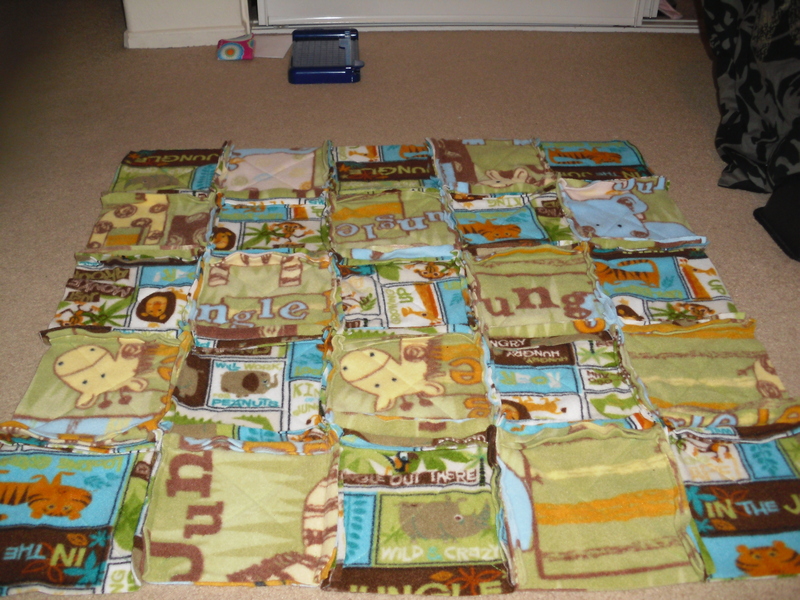 This is to make sure the pieces stay together well enough and line up evenly when put together in the whole quilt. I left about a 1/2″ of space at the end of each corner to make it easier to sew all the squares together later. 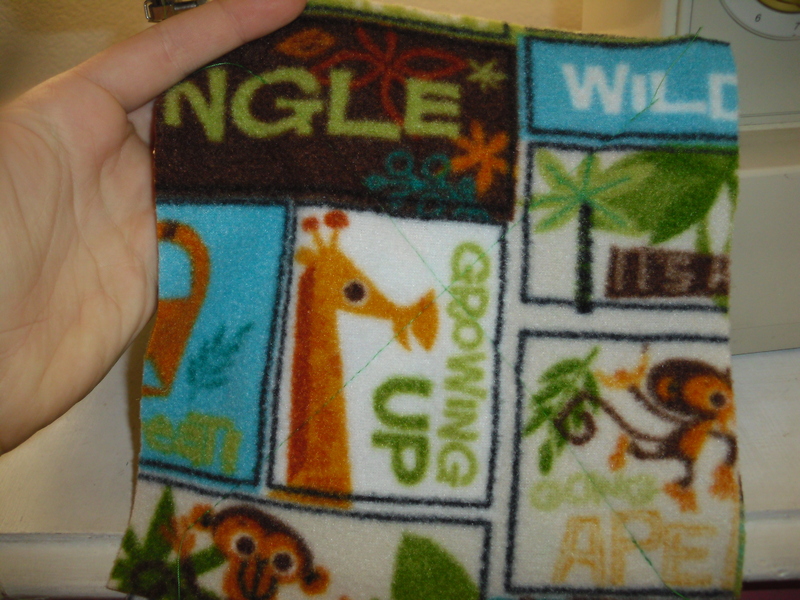 If you want to put batting inside, cut a 7″x7″ square of fleece and put it between the two pieces of fabric before sewing these X’s. I thought the fleece was thick enough without the batting. If you use flannel instead of fleece, you might want to line it with the batting. 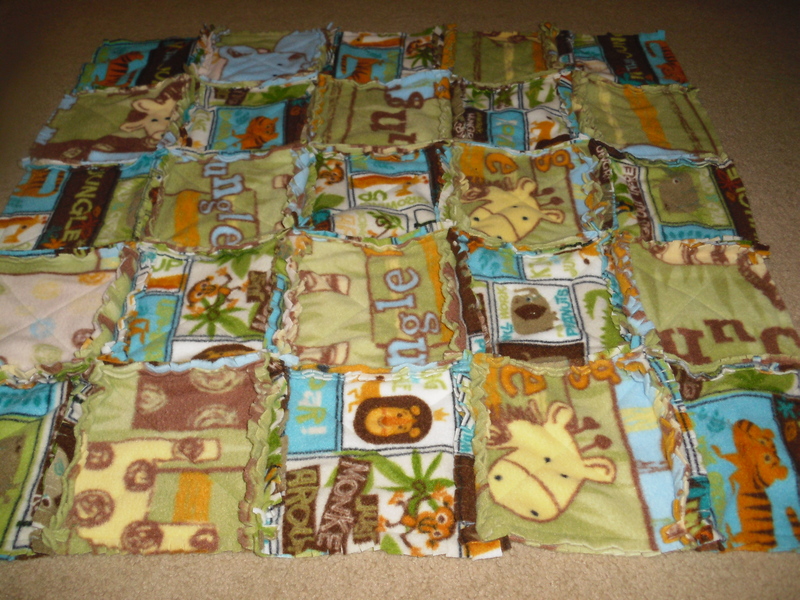 The next step was to sew rows of squares together. I essentially stacked two Xed squares and sewed a straight 1/2″ seam along one edge. Continue to do this with the whole row of 5 squares. 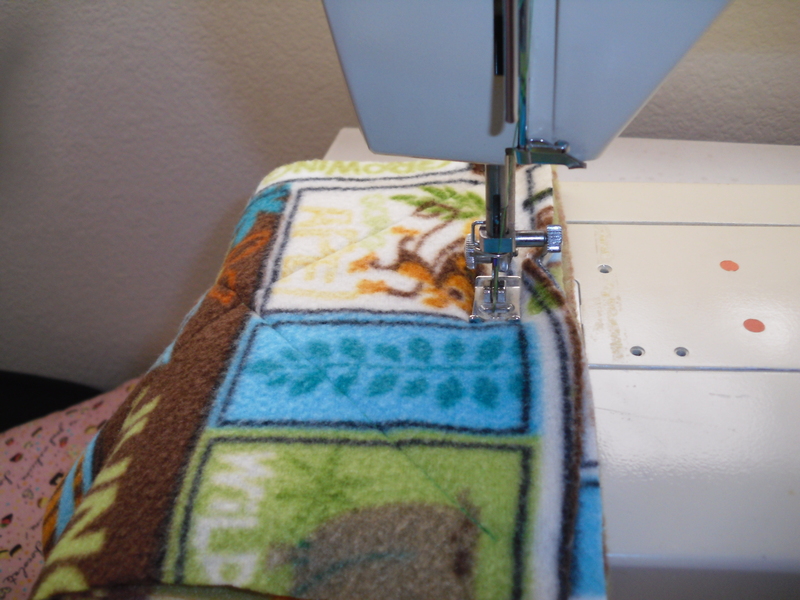 After sewing this seam, when you unlayer the two squares, you should have one side with a 1/2″ of fabric sticking out and when it’s flipped over, you don’t have any fabric sticking out. Once you have done this with all the rows, it’s time to sew the rows together. I was a little nervous about how well this part was going to work. I took a break so I could take a nap, and fell asleep trying to think through the steps I needed to take to make this work. I’m surprised I didn’t dream about sewing! An hour later, I made the attempt. It actually worked well, without much difficulty. 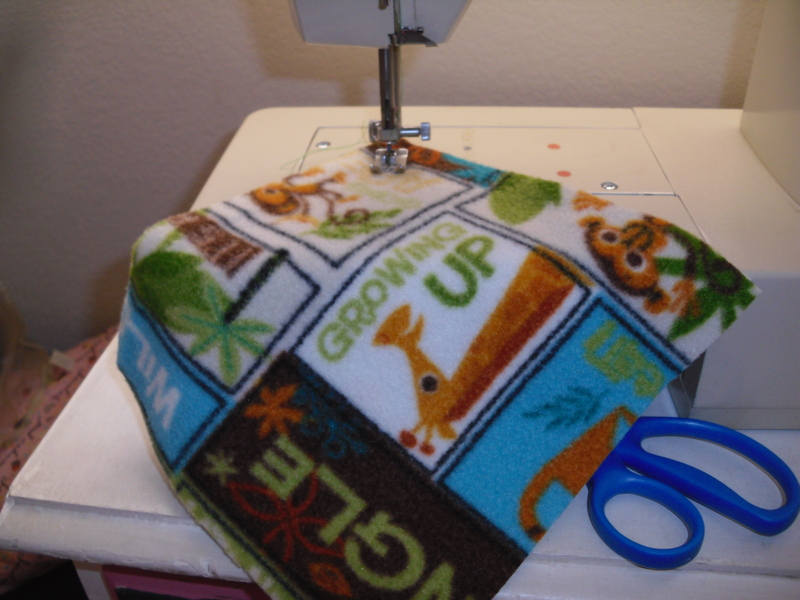 You do the same stacking and sewing a 1/2″ seam, you just do it with a whole row. 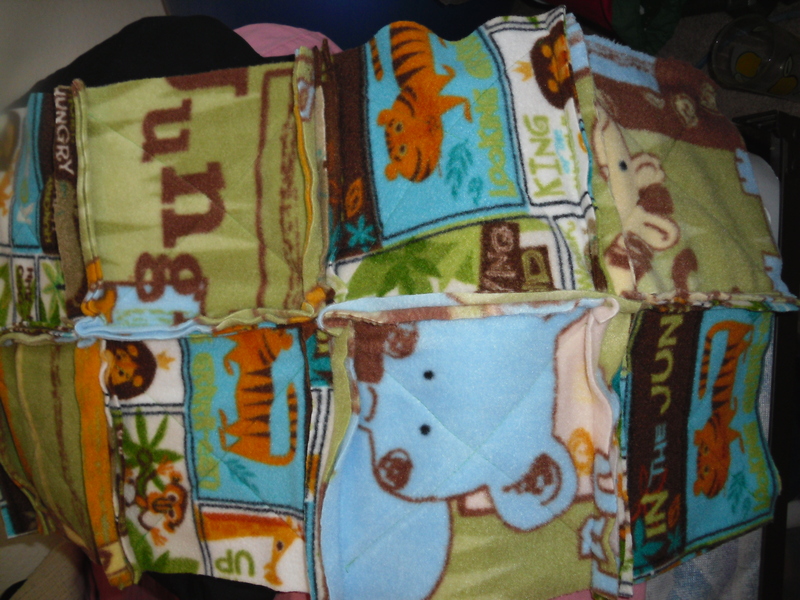 The only thing you need to watch for is the sticking out fabric on each of the sewn together squares. Make sure that two pieces or sticking out fabric are lying flat both on the top and the bottom so it will go through the machine easily. Continue until all rows are sewn together. 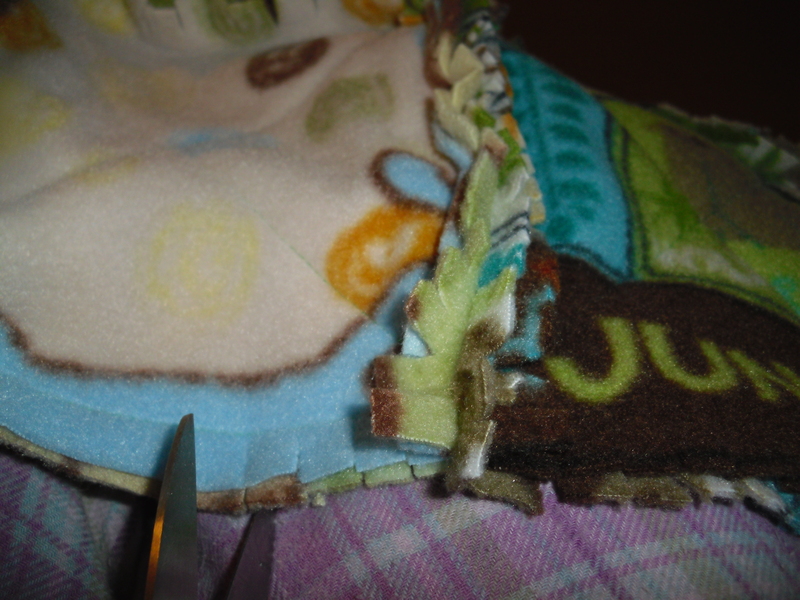 Then sew a 1/2″ seam around the perimeter of the quilt. No folding or stacking needed for this! Be warned, the final step has the potential to cramp your fingers the most. Make small cuts in the sticking out fabric up to the seam line. Cutting through all four pieces of fabric didn’t work very well for me, so I cut two at a time. Don’t forget to cut strips around the perimeter of the quilt as well! Once that’s done, you’ve completed your sewing project! 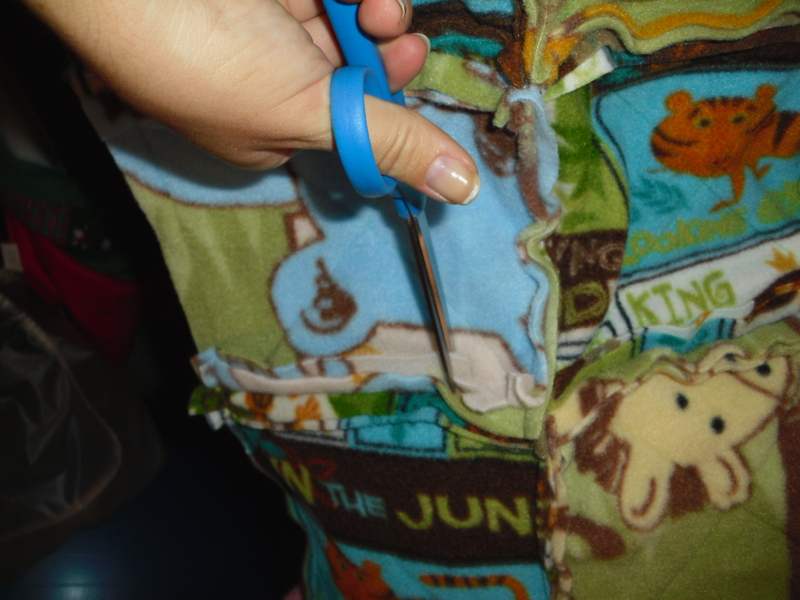 The last thing you should do is throw the quilt in the washer/dryer to mat the cut edges. 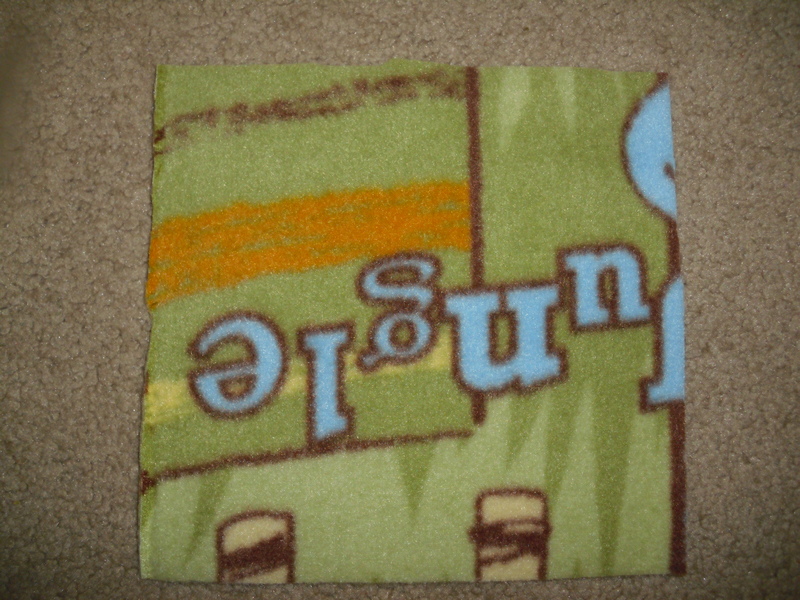 I’m not sure how much the fleece fabric will do this because it’s so thick, but it doesn’t hurt to wash it anyway. I had some school crayons that needed to be returned because their tops were broken off, but the crayons melted in my car before I got to the store! (Can you say warm weather in Cali??) I was about to throw them away when I remembered what my mom used to do with our broken crayons that we didn’t use anymore. She would melt them together in muffin cups and make lumps of crayon that were always a surprise to color with because you never 100% knew what you would get when you colored! It’s fairly simple to do. I’m probably going to give these out at the end of my kindergartners’ first week of school. 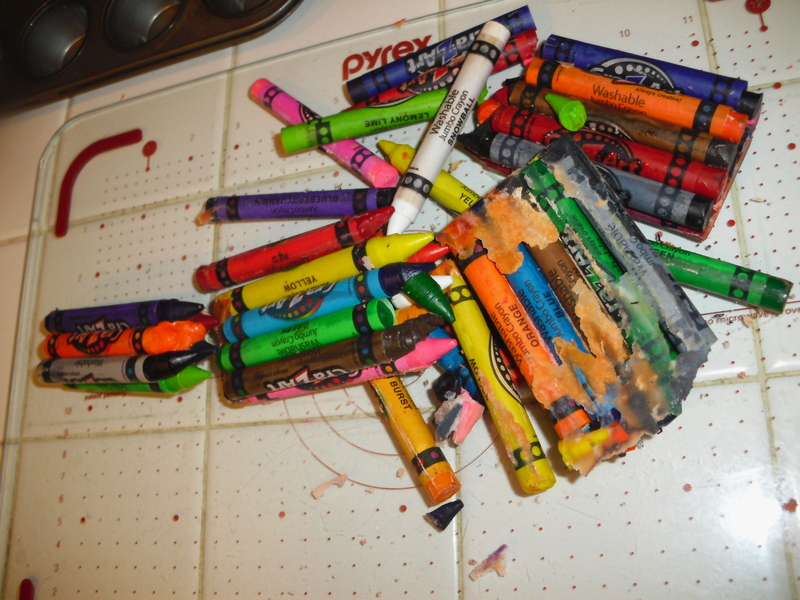 Using a knife, slice the crayon from one end to the other, deep enough just to peel the paper off easily. Then lay four crayons in a row and chop them into pieces. 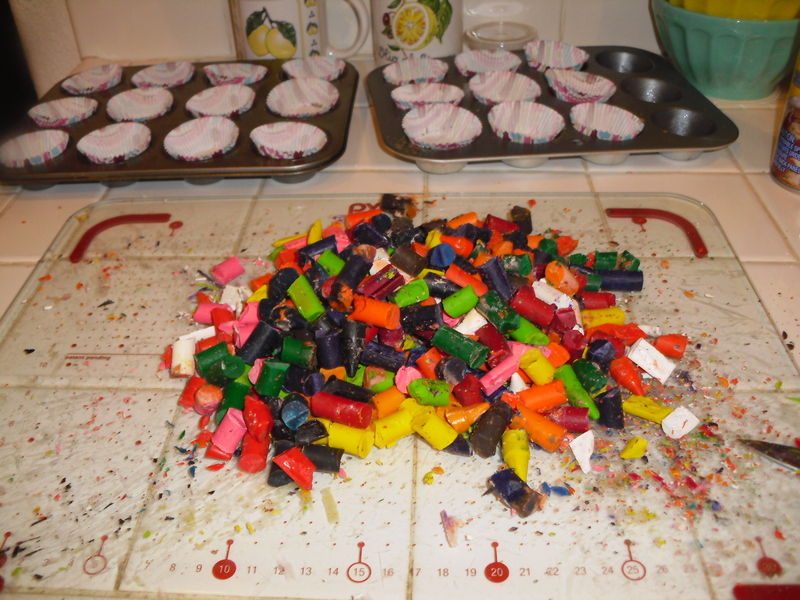 Scoop up mixed, broken crayons into lined muffin cups. 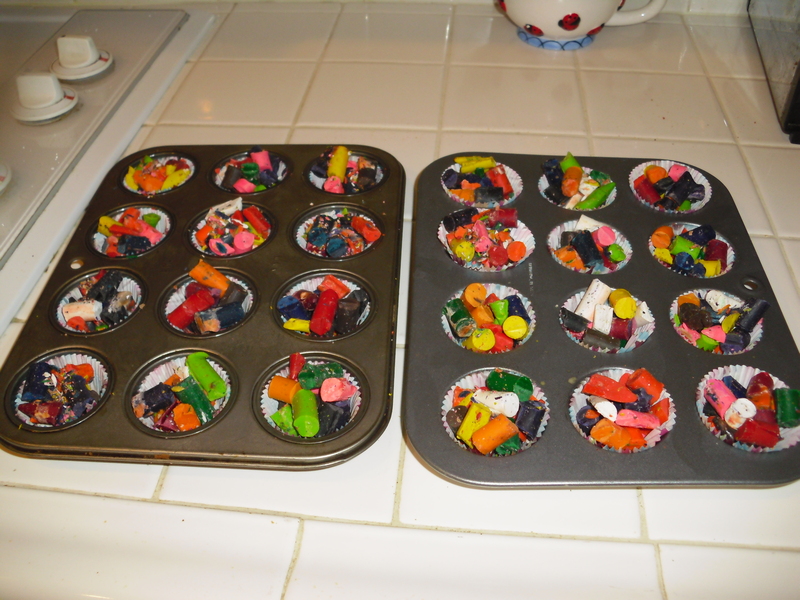 I used mini muffin cups, but it will work with large ones too! Put them in the oven for 230 degrees for 15-20 minutes or until they’re melted to liquid and you don’t see any chunks. 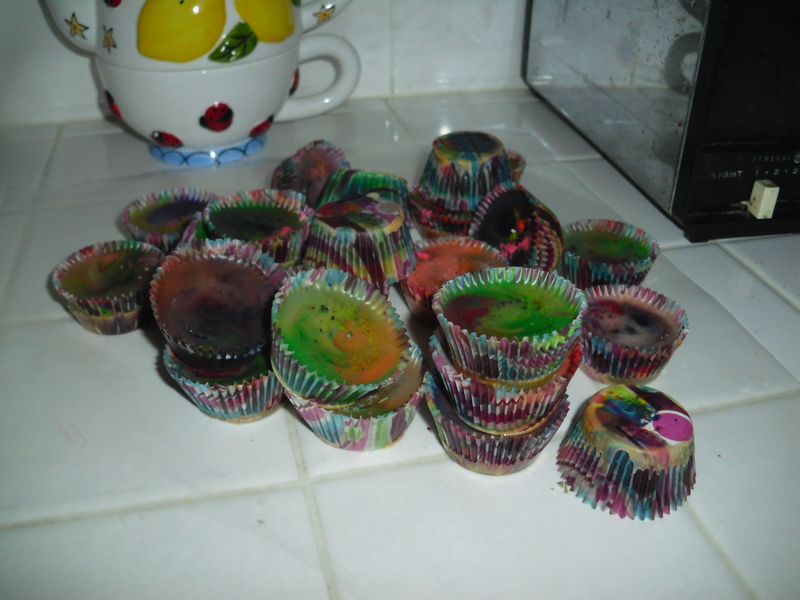 Take them out of the muffin pans, peel off the paper, and break off the rough edge at the top.